BELLEL A., BOUGHAROUAT A., RAYNAUD P., SAHLI S., SEGU Y.
elaborated from 50% of TEOS and 50% of O2 was found to be significantly more sensitive than film deposited from high proportion of oxygen due to dense structure. Concerning the selectivity, the results revealed a good affinity of the layer to methanol molecules. Fourier transform infrared spectroscopy (FTIR) analysis showed that VOCs molecules interact via hydrogen bonding due to the presence of the –OH group in the elaborated layers. Azizi C., Azizi M., Kaddour C., Mellal S., Zaabat M., Ziar T.
An analytical two-dimensional (2D) model to accurately predict the channel potential and electric field distribution in sub-micron GaAs MESFET based on (2D) analytical solution of Poisson’s equation using superposition principle is presented. 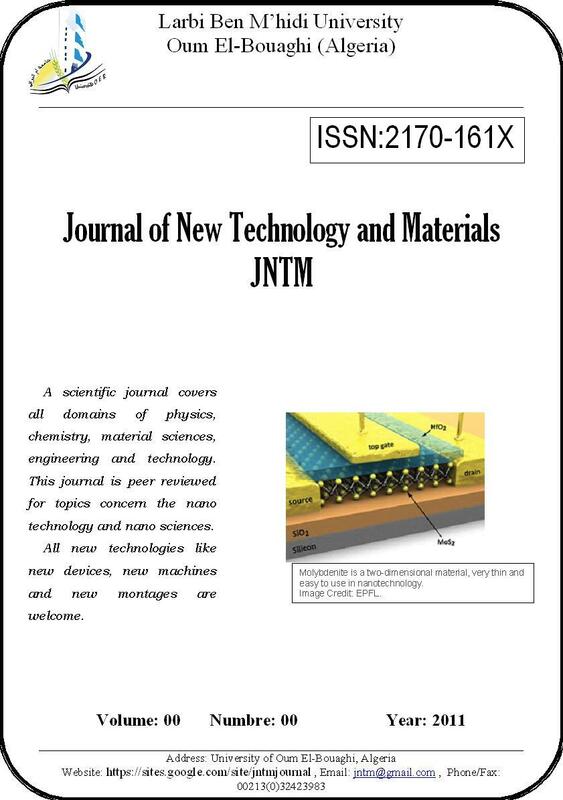 The results so obtained for current voltage characteristics, Transconductance and drain conductance, are presented and validated against both experimental I-V curves and various Models of the submicron MESFET GaAs. The model is then extended to predict the effects of parasitic resistances Rs and Rd, carriers mobility according to the electric fields and the edges effects on the performance. This model will allow more significant simulation of the component characteristics, with a precision improved for various conditions of Schottky barrier. The Speckle effect is a discipline with whole share. It is exploited in various scientific fields. On the application plan, it became a very powerful tool for the characterization and the non destructive testing. This technique which makes it possible to control and quantify in real time several parameters such as : the roughness of surface, the vibrations, the constraints, microphonedisplacements, the microstructure of surfaces, can be applied, at the same time, with the objects transparent and diffusing, solidor liquids. The development of flexible tools of capture of images to high resolution (camera CCD) coupled to information processing systems, nowadays makes the techniques speckle particularly important and interesting for industrial control. Ourwork consists in controlling qualitatively and quantitatively the variation thickness extracted the surface of the Duralumin sample (Aluminium alloy) immersed in a Salt water (to 3.5%), by using a camera CCD connected to a computer equipped with a software of image processing PRO-PLUS. Adoui M., Belaidi A. H., Gherraf N., Ouldjaoui A., Zellagui A.
Wastewater treatment is a very important process that consists of applying modern and new technology to improve or upgrade the quality of a wastewater because its disposal whether by surface, subsurface methods or dilution, is dependent on its treatment. In the present work a full study has been carried out dealing with the physicochemical and bacteriological properties of wastewaters after being treated in Oued Athmania Wastewater Treatment Plant. The results revealed that the findings are in conformity with the international standards.